Pepsi’s Lays has finally decided to counter the pig fat controversy. Their response was three-pronged. First they came out with a print campaign which included a a strip ad right on the front page of Dawn which says that Lays comply with the Shariat Council requirements and are therefore 100% Halal. But the print campaign didn’t’ address the root cause of the controversy- the E631 chemical found in the Masala flavor which is supposed to be made from animal fat. The ad is pretty vague as far as this point is concerned. The print ad should definitely have mentioned this, and then the online version would have delved into the intricacies of this compound and why it isn’t Haram in detail. 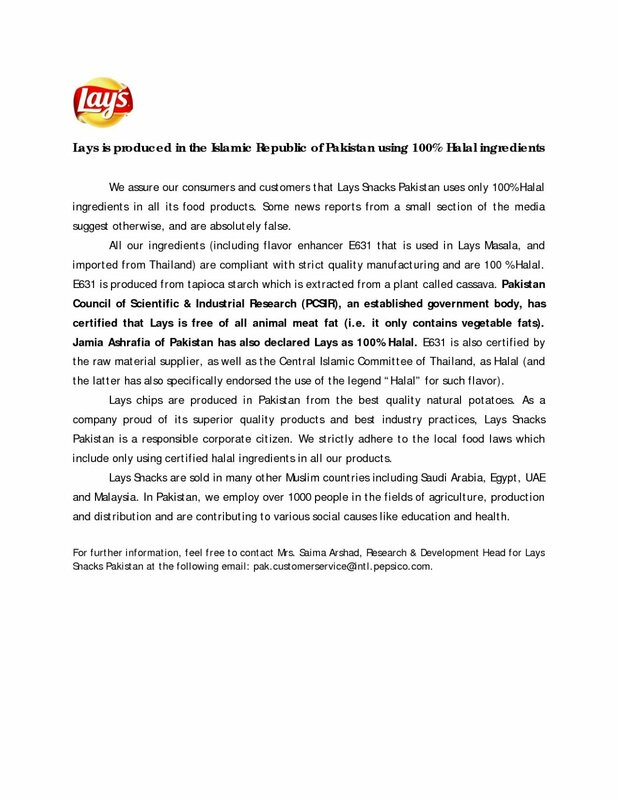 Many people, including want to believe that these chips they have come to relish are really Halal, they just need the official assurance that they are. But just saying that they are after all the hue and cry isn’t going to solve the problem. Get to the core of the problem. Then there was the online version of the counter-attack whose official source I’m yet to discover but which is available on many of the blogs which are siding with Lays. In the third phase came the TVC which again was vague as far as the E631 controversy is concerned. But then they did something which is sure to ignite their reversal of fortune. They made another TVC and a radio ad, but this time they got Vital Signs’ Junaid Jamshed to say that Lays are perfectly Halal and that he himself has verified that. Big deal? Very. JJ may have left the music scene, but he’s very much a hot brand even now. I remember some time back when he came to my neighborhood mosque for a ‘Bayan’. I couldn’t believe the sort of response he got, and that too from a segment of the market which grew up after he had left the scene. Youngsters thronged the mosque as if a legendary rock star had descended upon their locality. And then when he asked for people to join the Tableeghi jamat, it was the youngsters and pre-teens, people who can’t possibly be having an inkling of what great legends Vital Signs were, who stood up to join him. That’s the sort of presence he commands even now. That’s the ultimate brand power. If this is not a brilliant move by Lays to get Junaid Jamshed to endorse its brand, I don’t know what is. However, the fact remains that Pepsi Lays took its own sweet time in coming up with a response. Companies like these should always be geared towards encountering the Hala/Haram attack and should have a standard response in place to dish out as soon as the threat arises. Pepsi really needs to do some soul searching about its PR responses. Maybe now is the time to hire a new PR agency and a PR manager who is agile in monitoring the news surrounding the brand in every media and then quickly responding to any potential PR fiasco. really needs to do some soul searching about its PR responses. Maybe now is the time to hire a new PR agency and a PR manager who is agile in monitoring the news surrounding the brand in every media and then quickly responding to any potential PR fiasco.